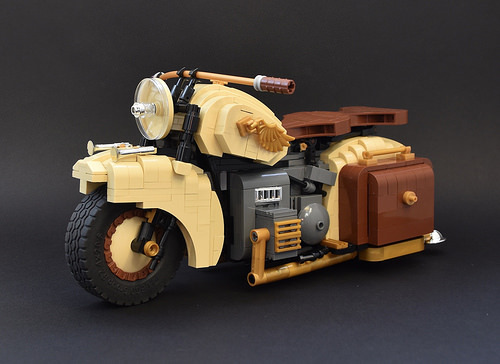 When it comes to channeling a chunky 50s-retro vibe in LEGO bricks, nobody does it better than Martin Redfern. 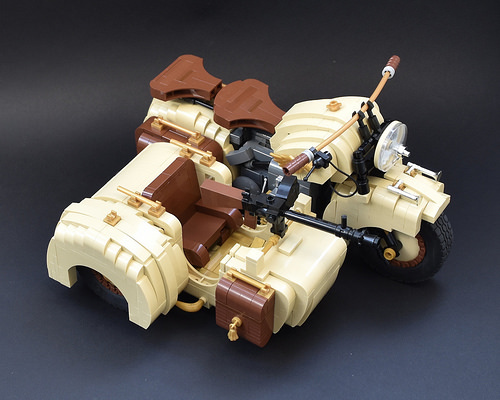 His latest creation is a brilliantly beefy-looking dispatch bike, complete with twin seats, leather pannier bags, a chunky engine, and wonderfully-curved fuel tank and mudguard. The large scale employed allows Martin to use the golden angel’s wing as a logo down the side of the fuel tank — a nice touch of detail. As an added treat, Martin has put together an “Afrika Korps” version, complete with side-car and machine gun. Great stuff.